A guide to real time traffic, travel and weather information in France, also including tolls (or not), the auto toll tag, traffic forecasts, emergency contacts and news sources in English. Plus, links to this year’s need-to-know driving news stories. Without doubt the best source of real time info on driving in France is autoroutes.fr hosted by ASFA, the association of French motorway operating companies. As well as a journey planner which includes toll rates (and fuel costs) for motorways and tunnels and bridges, it also has real time traffic and weather, webcam locations and traffic forecasting on specific dates, times and locations. It also links directly to the various 107.7fm radio stations around the country which broadcast traffic information every fifteen minutes, with a round up in English. 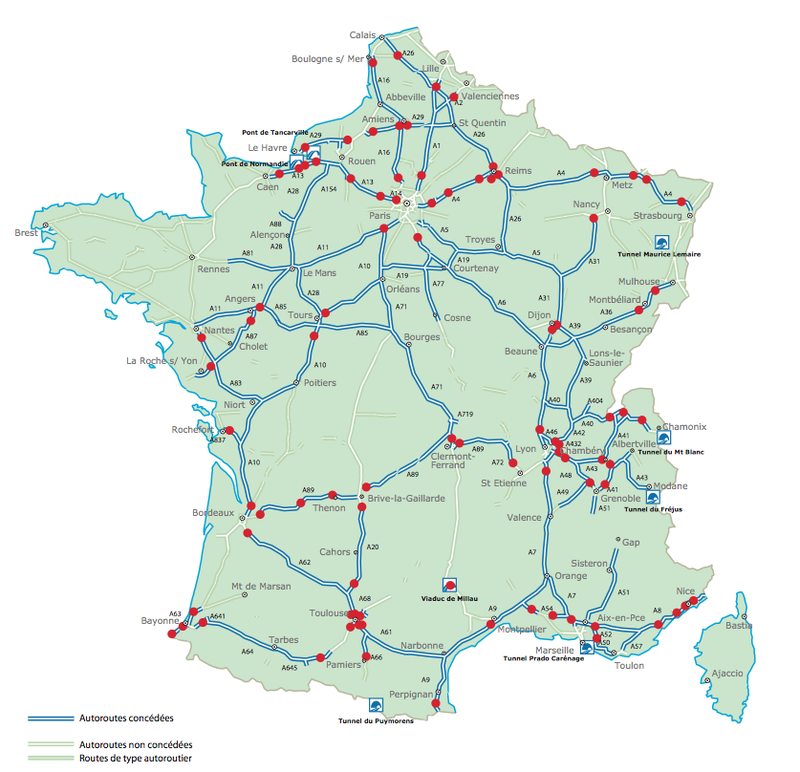 Autoroutes.fr also lists the motorway operators. There are twenty two in total of which the biggest are Vinci (four separate companies running roads in the west and most major roads across the south) and Sanef (north and east). All the operators have their own websites and, increasingly, Twitter feeds and information in English. Sanef Tolling also runs the automatic toll tag service for British drivers, from the UK. See more. Useful in the winter is ATMB (Mont Blanc Motorway and Tunnel operator). Always useful is the link to Mont Blanc Tunnel for current delays and maintenance schedule. The SFTRF Frejus Tunnel site never seems to work properly. Check delays on the French side via autoroutes.fr and SITAF A32 for Italy. Prix Carburants collects info on current fuel prices around the country. The official French traffic information service is Bison Fute but it doesn’t work on all devices. However, the jam calendar showing the busiest days at a glance is essential reading when planning trips. The @VinciAutoroutes twitter feed posts a brilliant hourly graphic of the delays on the major roads on ‘Black Saturdays’ (the busiest holiday getaway/return days of the year). Also see our guide to France 2015 Black Saturdays and Avoiding the Worst on Black Saturdays. Very handy for driving through the mountainous Massif Central is DIR Massif Central with at-a-glance webcams. DIR (Direction Interdepartmentale des Routes) regions cover the whole country, and are linked to each other, but they are all different with varying levels of information, none of it in English. However DIR should be the first stop in emergencies, e.g. flooding or heavy snowfall on the roads in the Pyrenees or Alps. Also useful in emergency situations are the local Region and Commune websites (French only) and, particularly, this list of twitter accounts from the Prefectures around the country (see a map of prefectures). As in the rest of Europe the emergency contact telephone number 112 should have an English speaker at the other end. Meteoalarm gives notice of extreme weather events, as does MeteoFrance. The three main news in English websites are thelocal.fr, The Connexion and France24. The English language feed from the British embassy in Paris – @BritishinFrance – posts official advice on breaking news. There are hundreds of websites and publications about France. Complete France seems to cover all the bases. The official tourism website is Rendezvous en France with links to all regions. Keen drivers should see Drive Guide Guru from Julian Parish, the author of France: The Essential Guide for Car Enthusiasts. PassHunters.co.uk is a guide to French mountain roads in English written by locals. For the locations of the major mountain roads see our PassFinder. For driving rules and regs see the AA, RAC, TISPOL police driving guides or the EU’s Going Abroad app. Bison Fute and autoroutes.fr also both have FAQ-style sections in English. 18 June: road deaths rise again ahead of new road rules in July. 17 June: the mystery of the Lacets de Montvernier; A1 Paris bus and taxi lane appeal; taxi strike to paralyse major cities, booze cruise threat due to Calais migrant crisis. 16 June: Grenoble-Briancon road to reopen in ‘weeks not months’. 15 June: Le Mans, 943 out of 2000 (mainly British) drivers caught speeding. 9 June: new French eco-stickers upset car makers. 28 April: new Paris motorway bus and taxi lanes. 21 April: Tour Auto kicks off in Paris destination Biarritz. 6 April: Paris, recreating Rendezvous. 19 March: dust up over Paris pollution. 11 March: compromise on French road tolls. 10 March: sprucing up the roads around France. The end of the tree-lined avenue? 24 February: proposed Weymouth-Cherbourg ferry to beat Dover-Calais. 16 February: jam dodging A43 Lyon-Chambery. 11 February: progressive diesel bans Paris start 1 July. 10 February: half a million Brits dodge France speeding fines. 27 January: France road safety ‘crisis’. 12 January: concerns over new French eco-diesel.